Apologies to Diva Crow’s devoted readers! It appears the staff is undergoing some sort of organizational molt. Aside from Daylight Savings Time, we have been remiss in acknowledging the advent of spring. But in all fairness, spring itself is a little behind the curve. Perhaps the season is waiting for proper acknowledgment of the following milestones. The March full moon is known as the “Crow Moon,” because the crows caw to say farewell to winter. This year it fell on March 1-2 and was followed by a wind storm that forced DC to shut down (legitimately for once) and the year’s only noticeable snowfall, which happened last week. So perhaps we can be forgiven for not noticing. The good news is that the next full moon is March 31, also known as a “blue moon,” i.e. a rare second full moon in the same month. (Hence the phrase “once in a blue moon” to mean something that doesn’t happen very often.) So Happy Crow Moon 2.0 to everyone out there. Let’s hope this one really does mean that spring is on its way. I searched for a connection between corvids and the equinox but couldn’t find one. 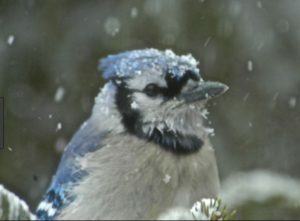 So there’s not much more to be said other than March 20 marked the transition to longer days, which means more daylight, which triggers bird migration and boots avian hormone production into high gear. The arrival of spring is a gift because it marks the time of year that Gwen and I set aside our differences (not that she forgets a single slight) and work together over six weeks or so to produce the World’s Greatest Nest. After four years (hard to believe), I have become pretty adept at spotting a suitable stick. For the first phase, they must be 18 to 24 inches long, straight, and between 1/8th and 1/4 inch in diameter (although to be honest, a 1/4 is really too thick but Gwen will consider them). I collect between 10-12 at a time and place them on the Table of Offering. Gwen flies down to examine them and takes a few days to sort through them. Rejects are left by the door of the enclosure. Possibilities are strewn about in case they are needed whereas the perfect ones are taken into the Super Secret Inner Sanctum, which currently is waiting for the project to begin. 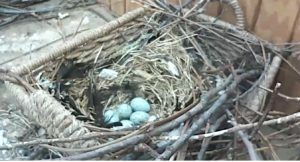 As the process goes on, Gwen will require shorter and thinner sticks or even vines to fill in the gaps between the sticks in the nest. Finally, she will construct a soft inner lining from leaves, horse hair, paper towels, and whatever else turns up. Here’s last year’s version. 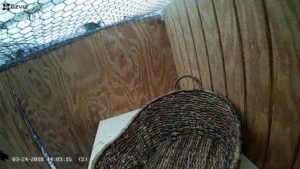 Gwen and Stephen started and abandoned several nests before finally settling on this in-basket version. So enjoy the warm weather when it finally arrives and settle in for Chick Watch 2018. Fingers crossed for healthy babies.